(Gallatin County, Mont) It started Tuesday about 12:30 when a 23 year old Bozeman woman injured her leg while skiing at Bridger Bowl. The Ski area is closed for the season but is still used by many local skiers who are ambitious enough to hike the mountain to get a few more turns in for the season. She had just started down and on the first turn caught a ski in the heavy snow flipping her over the front and injuring her leg. Members of Sheriff’s Search and Rescue who are also employees of Bridger Bowl were on site doing maintenance and were notified of the injury. They extricated her from the top by skis and rescue toboggan. They were assisted at the base by SAR members responding from the valley, Bridger Canyon FD and AMR ambulance. 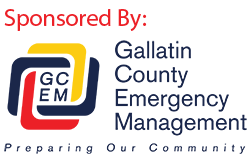 At about the same time a report of a kayak upside down pinned against a rock in the Gallatin River near mile post 63 was received. Some SAR units were diverted from the Bridger call to go that way. Sheriff’s Deputies and Highway Patrol units were able to locate people on the shore who claimed the kayak was theirs and determine that no one was still in the water. On the south end of the county at approximately 3:54 pm Sheriff’s Search and Rescue in West Yellowstone responded to the report of an overdue hiker in the Beaver Creek drainage which is approximately 21 miles northwest of West Yellowstone. Yellowstone National Park Rangers, and a helicopter from Eastern Idaho Regional Medical Center stationed at the West Yellowstone Airport were enlisted to assist. Information provided to the investigating Deputy led search teams to a last known location logged by the missing hiker with a GPS the previous afternoon. While search teams moved through the area by snowmobile, the Air Idaho Rescue Helicopter was able to locate and transport the hiker to West Yellowstone Airport where he was checked out by EMS personnel. The hiker was dehydrated, and tired but otherwise uninjured after spending the night exposed to the elements.